On a warm and wet October evening, a few years back, I crouched in the glow of my truck headlamps in disbelief as hundreds of young bullfrogs moved north before my eyes. I happened upon a north Idaho invasion of this destructive non-native species that spreads disease to native amphibians and eats most anything in its path. As a wildlife biologist for the Idaho Fish and Game, I was spurred to seek solutions. American Bullfrog Range in the USA. Artwork for TheFisheriesBlog.com by Hannah Dean. I didn’t know what to do a few years ago as I knelt on that deserted county road and watched a non-native predator march thru the rainy night. But I know now. A couple seasons later I found myself in the back seat of a canoe waiting patiently for a male bullfrog’s call to guide myself and a coworker in to make a kill. Electrofrogging has turned out to be the first in a series of strategic moves to make a parcel of state land a cool refuge for climate sensitive species as we move into a warmer future. Like so many conservation issues, it turns out the invasive American bullfrog problem is confounded by climate change. Native to the southeastern United States, bullfrogs were introduced as a game species to many places, including the Pacific Northwest, as early as the late 1800s. 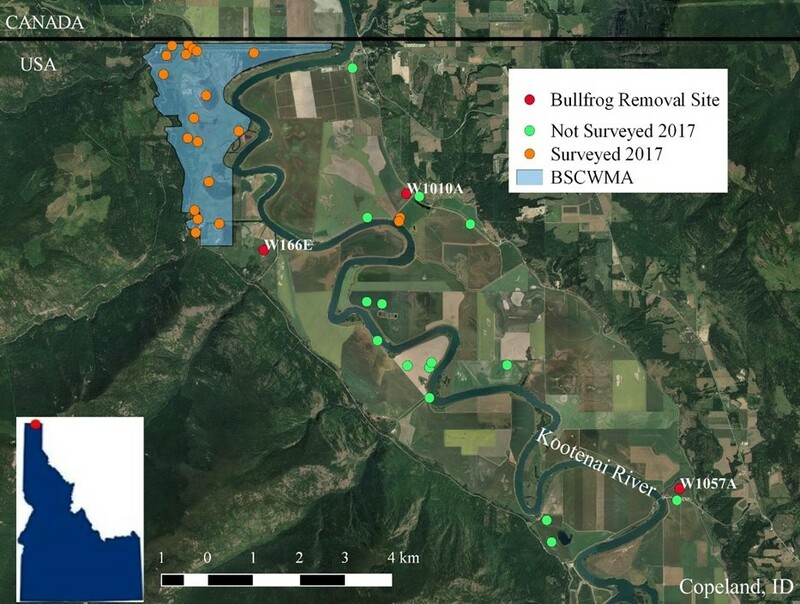 Bullfrogs did okay in these new climes but our lengthening and hotter summers are likely making the northwest even more suitable bullfrog habitat. Bullfrogs will eat just about anything, including fish, mammals, crustaceans, and other amphibians, hence the concern with their introduction. Idaho’s State Wildlife Action Plan identifies the threat bullfrogs pose to native Species of Greatest Conservation Need, including northern leopard frogs, and western toads, and outlines the conservation actions we are undertaking to address the bullfrog and climate threats. Bullfrogs have been very successful as an invasive species. Because they are cannibalistic, they can actually create ecosystems as they move. An adult female lays eggs, tadpoles feed on plant material, then the tadpoles provide the adult with plenty of young to eat – some of which grow up to invade their own pond. This multi-trophic level invasion strategy has made bullfrogs a force to be reckoned with. But a kink in their ecological armor may provide a key to bullfrog control on at least a local level. 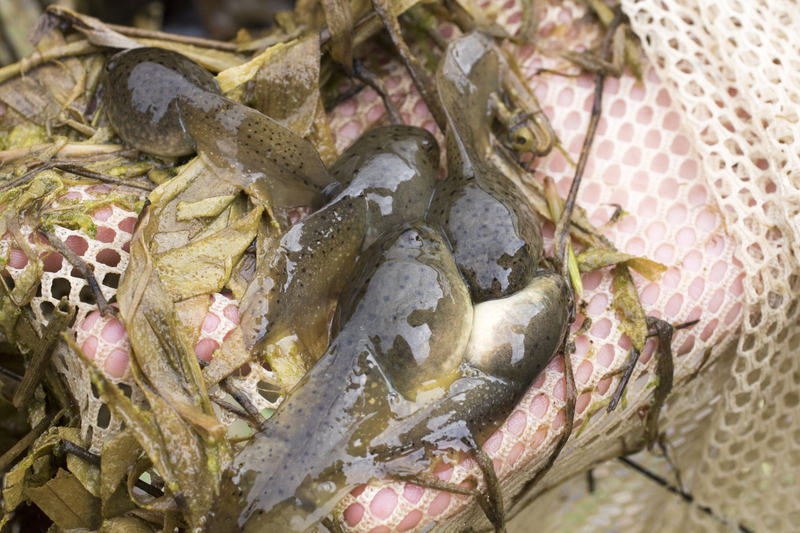 Bullfrog tadpoles sometime fill out nets during amphibian surveys. A disheartening sight. Photo by David Moskowitz. 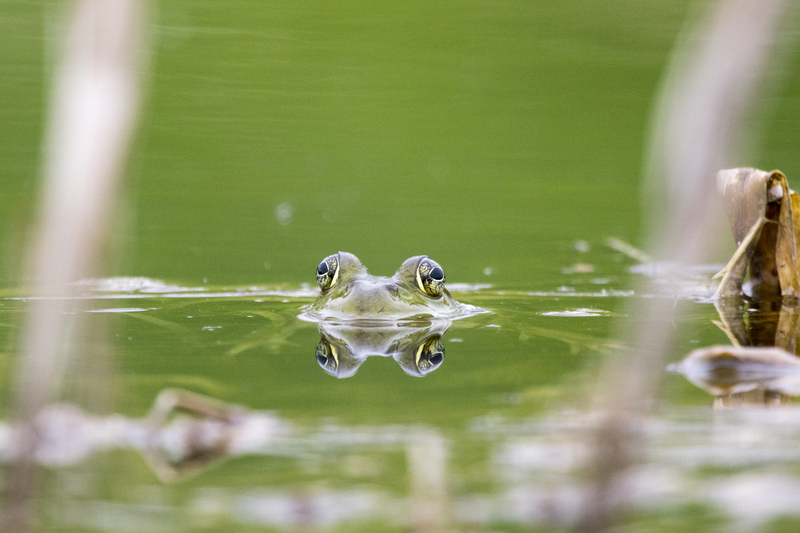 In the Pacific Northwest, bullfrog tadpoles can only partially metamorphose during a summer season while their native counterparts complete an entire lifecycle in one summer season. We are using this to our advantage on Idaho’s Boundary-Smith Creek Wildlife Management Area (BSCWMA) by building ephemeral ponds that will dry up each winter. Part of the larger Bees to Bear Climate Adaptation Project, these ponds will dry up each winter and bullfrog tadpoles won’t be able to survive in the dry conditions. While we are working on the ponds, we are using electrofrogging as an international short-term strategy to prevent bullfrogs from first colonizing BSCWMA and then making it just a few kilometers north to the Creston Wildlife Management Area where one of the last colonies of Northern Leopard Frogs remains. Electrofrogging, invented by Stan Orchard, has shown promise of successfully removing bullfrogs from small areas. 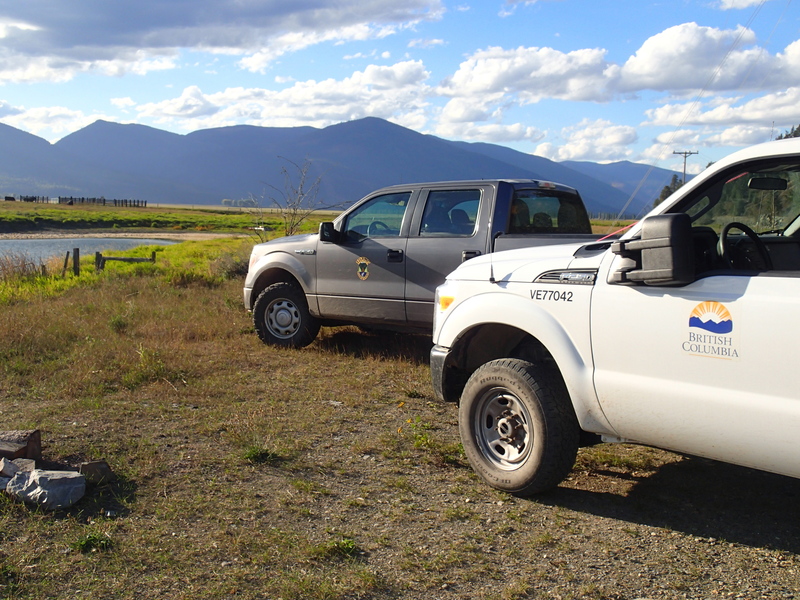 Our partners in British Columbia have been electrofrogging for a few years now and, in 2017, we began earnest efforts to try the technique on our side of the border in Idaho. Map of wetlands surveyed for amphibians in 2017. Orange dots represent wetlands surveyed for amphibians, red dots are wetlands where we conducted bullfrog removal, and green dots are wetlands on private land that we did not have permission to survey. Bullfrog removal sites were also surveyed for native amphibians. The technique is a pretty simple concept. A team of two people take a boat (we used a canoe) out in a small body of water after dark. One person paddles while the other is ready with a electrofishing backpack. Both people use very bright lights to search for eye shine (crucial for getting the frog to stay still). When a bullfrog is detected the person in the stern of the canoe paddles in while the person in the bow gets ready with the Electrofrogger Electrode. Smith-Root makes a special Electrofrogging Electrode designed specifically for attaching to backpack electrofishers. Attaching the specialized Electrofrogging Electrode to the backpack electrofisher. As the person in the bow is directed in, they slide the wand in under the frog, and once it is directly under the animal, they press the button on the electrofrogger wand. If all goes well, the frog ‘supermans’ and is frozen for a few seconds while the wand is passed back (power that electrofisher off!) and placed in a screw-top bucket. Dipnetting an invasive American Bullfrog from the electric field. We make successful laps around the pond until there are no more adults or we just can’t catch anymore. After we get back to shore we euthanize the bullfrogs with clove oil. 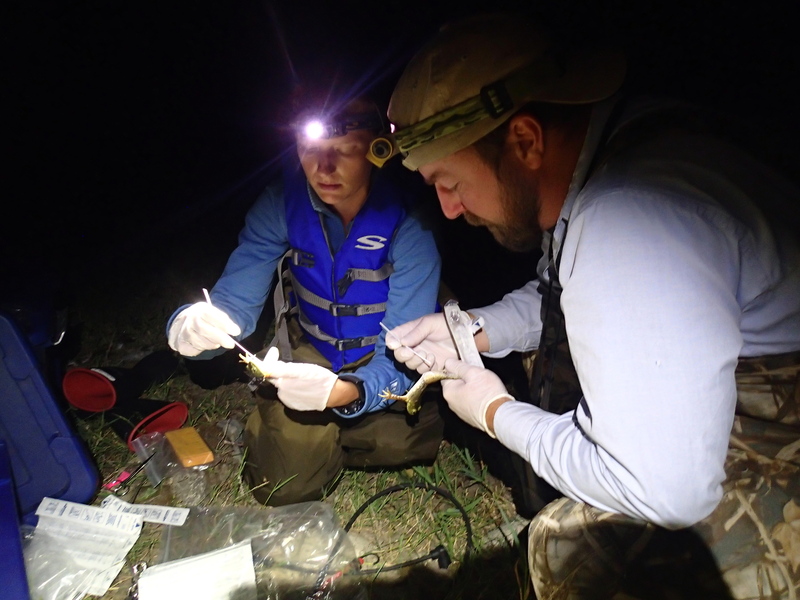 IDFG Wildlife Diversity Technician Leah Swartz and Habitat Biologist Evan DeHammer take measurements on bullfrogs. While the task is simple when the frogs are spotted and they behave, the frogs seem to behave less and less with each subsequent visit. The first visit usually went pretty well but the frogs seemed to be ‘onto us’ on successive visits. I don’t know if that’s because they were keying into the fact we were a threat or the ones on later visits were just more used to hanging out in the vegetation – but it sure seemed harder the second and third visit. Accordingly, we have seen success at some of our ponds, and are currently withholding judgement on others. Wetland 1010A had only a few very large individuals (including a big male that got away and haunts our dreams). Wetland 166E saw the most dramatic improvement with 15 frogs caught the first visit and zero the last. We captured 6-7 bullfrogs during each visit of wetland 1057A with no decrease over time. That wetland was difficult to work in because it had an over abundance of vegetation on the edges. Our first survey of this wetland in 2018, though, suggests mostly small bullfrogs, so perhaps we had more success than last year’s depletion estimates indicated. Number of bullfrogs removed from each of 3 ponds where electrofrogging removals occurred. Other than the total number caught, we saw a trend of smaller frog sizes over each visit. This is hopeful for us that we are removing the mature animals from the pond as we go, which is the objective of the project. 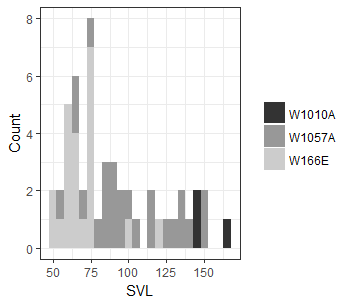 Size distribution of bullfrogs removed from each site. One year of work will definitely not solve our bullfrog problem. We don’t even bother with collecting larvae (there are so many) and success will require several summers of work as successive frog generations mature. During this time though we hope to manage the spread of bullfrogs in our small project area in the Kootenai Valley to buy some time for our ephemeral wetland construction in Idaho and the northern Leopard frogs just across the border in BC. Other folks are adopting electrofrogging to control the spread of invasive bullfrogs, including Washington Department of Fish and Wildlife. 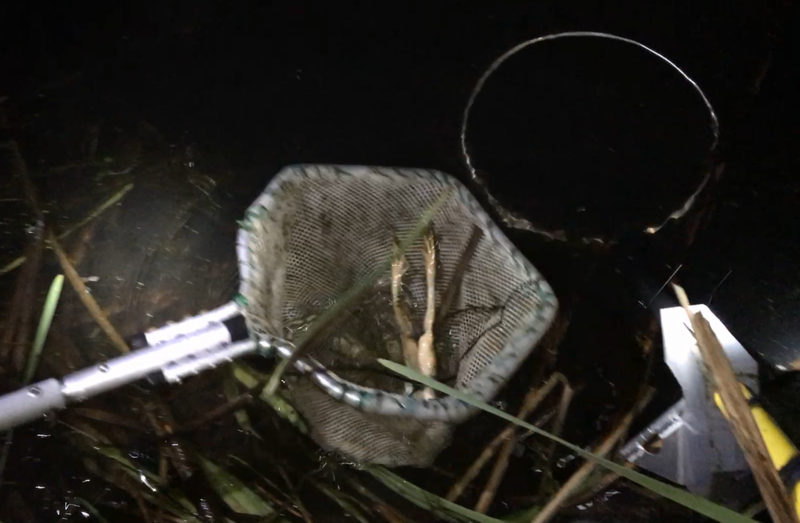 Here is some video of a recent trip they made where they were successful in removing over a dozen adult bullfrogs from a pond that contains endangered Western Pond Turtles. You need really bright lights. Get the expensive ones. Think 1,000 lumens and at least $100 each. Weather matters. Temperature should be at least 35F (warmer is better), it should be pitch black, and very little wind. Precision paddling is crucial and wind blows the boat around. Electrofisher settings that worked for us: 35 Volts, 55Hz Frequency, 20% Duty Cycle, Pulsed Direct Current. Your bucket needs a lid – a good one. Bullfrogs are really strong and can force their way out of even a cooler. A 5 gallon bucket with a screw top lid works great. Bullfrogs are very difficult to euthanize. Clove oil works quickly and well. Leave them in the clove oil until morning to be sure – and if you use any other method be very sure they are dead before disposing of them. Download our 2017 report including protocols and datasheets. Our transboundary project is working to manage bullfrogs so that native amphibians can thrive in a warmer future. Interesting and important work! But I have to wonder if there is an easier way. If we were to undertake this project here at a university we would have to use a similar approach due to IACUC regulations. But licensed anglers in our state (and many others) can legally harvest bullfrogs by gigging or hand grabbing. I grew up hand grabbing bullfrogs along streams in the Ozarks, so am partial to that method. But from the video footage it looks like gigging might be the better option in these habitats. This might be a chance to recruit the public to do some ‘citizen science’. A few bullfrog gigging tournaments, with some modest prizes, might net as many or more bullfrogs as the electrofishing method, freeing up the biologists to collect data on the frogs and overall requiring a lot fewer staff hours and lower equipment costs (sorry Patrick! ).